Well, this has been a long time coming. 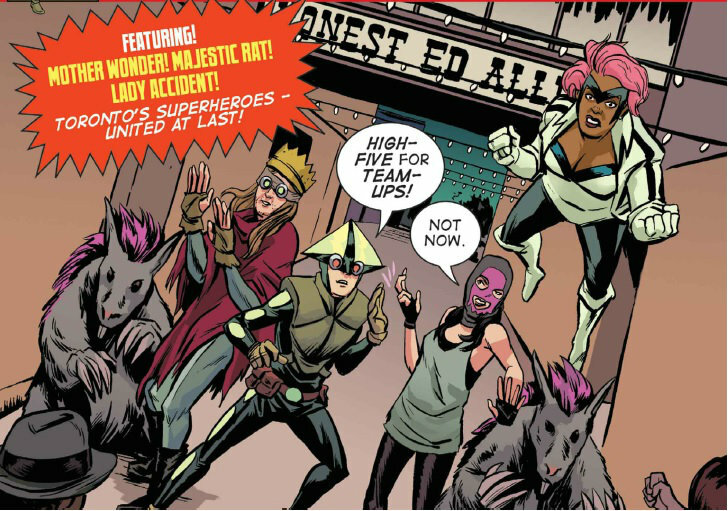 A superhero comic by Canadians, for Canadians, that actually feels Canadian. And it almost slipped under my radar somehow. How typically Canadian. 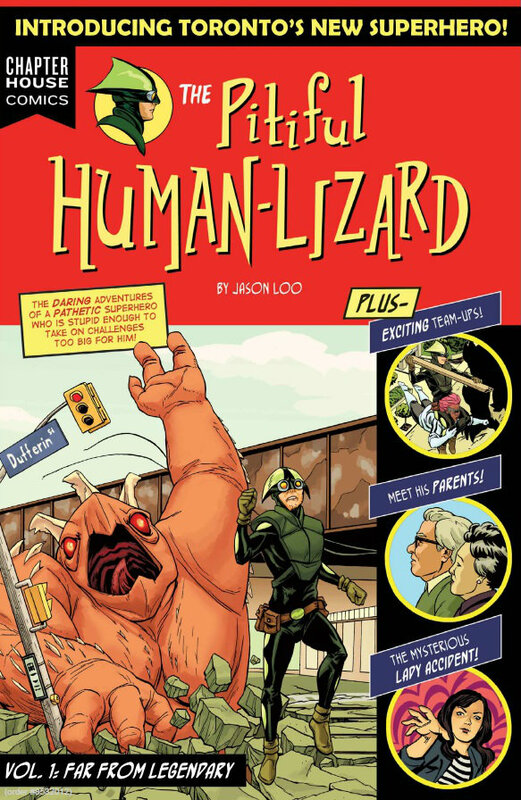 Following the misadventures of Lucas Barrett, aka the Human Lizard, Jason Loo’s unassuming superhero epic began life as a very popular, very successful Kickstarter campaign. 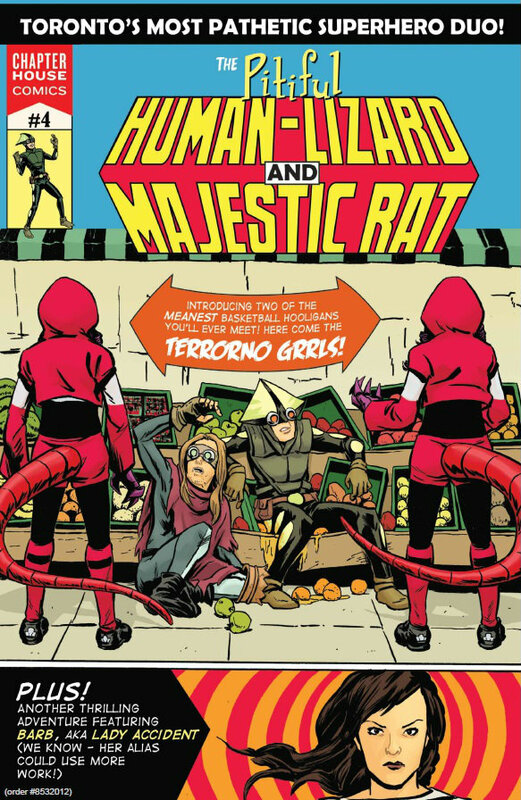 Attracted by the book’s hip, DIY attitude, an eclectic cast of down-to-earth characters, and a built-in loyal fan base, it’s no wonder Toronto-area publisher Chapterhouse Comics quickly picked up the series, ensuring Lucas’s ongoing quest to become Toronto’s strangest masked guardian continues to see print. Here are a trio of reasons why you should be reading this witty, well-crafted celebration of all that is fun and utterly ridiculous in a world ruled by capes and spandex. And there ain’t a pitiful one in the bunch. And by Canadian, I mean, of course, Toronto. Canadians hate when people say that. I’m pretty confident I just pissed off the 30 million or so people in Canada who don’t live there. Dubbed the “centre of the universe” for reasons those of us who have actually lived there can’t fathom, Toronto tends to get a bad rap from the rest of the country. It’s not that hard to understand, really. Toronto is the largest city in the land and receives the lion’s share of the spotlight on the world stage. In reality, it’s a colourful, ethnically diverse modern metropolis, with a rich cultural identity founded on inclusion and tolerance. It’s by no means a utopia. Like every major urban centre, “the Six” has its problems (Drake’s silly nickname only the least of them). But that’s where a guy like the Human Lizard comes into play, isn’t it? Loo’s depiction of his hometown is spot-on. 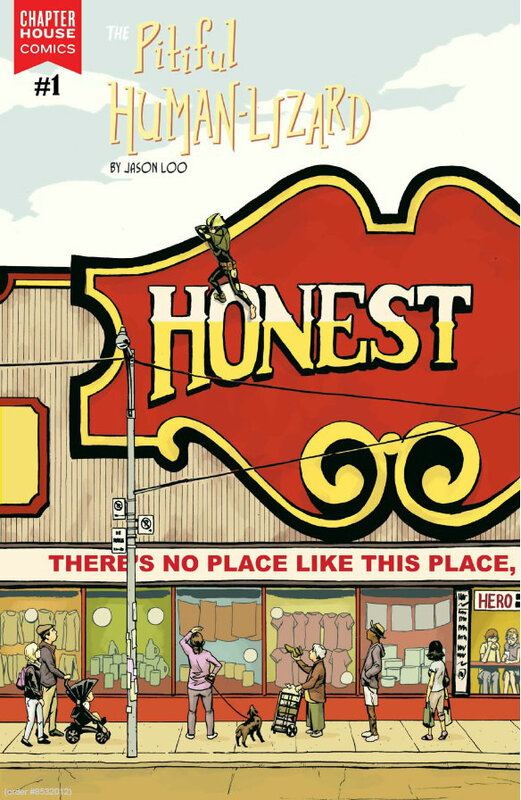 With loving observational irreverence, he perfectly captures Toronto’s colourful inhabitants in all of their hilarious and sometimes tragic glory. It’s more than just dropping a few names and throwing in some familiar landmarks. It’s the utter nonchalance, the easy familiarity with the people of Toronto that allows The Pitiful Human Lizard to resonate so deeply with its readers. 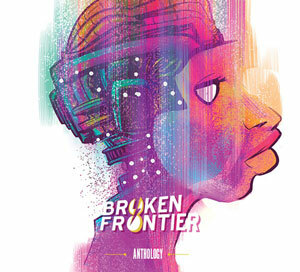 This is a book that embraces cultural diversity in whatever form it takes. In this, the cast of The Pitiful Human Lizard accurately reflects Toronto’s deep multicultural roots. 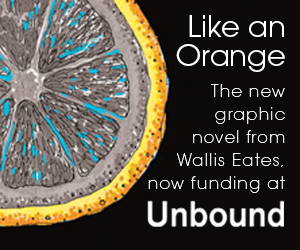 This, of course, is a Good Thing. What’s even better, as Sam Maggs (The Fangirl’s Guide to the Galaxy) notes in her introduction to the trade paperback, is Loo’s refusal to pander or preach or even give explanation for his diverse cast. Lucas himself is Chinese-Canadian, from a mixed-race marriage. His best friend and comrade-in-arms, the Majestic Rat, is a gay cashier by day who telepathically controls a legion of multi-coloured rats by night. The city’s premier superhero, Mother Wonder, is a black wife and mother of three, who also happens to hold down a full-time job when she isn’t soaring above the city fighting crime. And none of it is a big deal. It just is. As it bloody well should be. At its heart, The Pitiful Human Lizard isn’t just about superheroes. It’s about the people beneath the masks – glorious freaks, geeks, and misfits, all – who find the drive or courage or utter stupidity to protect their communities from all manner of evil (or just plain unfortunate) weirdness. There are no Tony Starks or Bruce Waynes in these pages. Lucas gains his regenerative powers by volunteering for an experiment so he can afford his Brazilian jiu-jitsu classes. He and the Majestic Rat buy their signature goggles in bulk (whenever they’re on sale, of course). Mother Wonder relies on her stay-at-home husband to take care of the kids and works a full-time job to put food on the table. This is a world where the everyday intrudes on the extraordinary with startling frequency. It’s probably the best thing to happen to a superhero comic in decades, echoing the early days of Peter Parker’s awkward navigation through the pitfalls of adolescent superheroics. Even if he doesn’t share the Wallcrawler’s full mask, we get the feeling that in a perfectly imperfect world, any one of us could be Lucas Barrett. It’s a quality that informs everything about the book. Lucas’s story reads less like a typical superhero epic and more like an introspective graphic memoir. Loo’s clean, unadorned illustrations bring to mind early Tomine rather than early Byrne. It’s a refreshing departure from the spectacle-laden, homogenized approach used in modern superhero comics and distinguishes The Pitiful Human Lizard from much of the over-produced, uninspired dreck currently infesting the catalogues of mainstream publishers.